Red West died at the ages of 80 on July 18, just a few weeks after his cousin Sonny. In November he would have turned 81. Red is known for his friendship with Elvis to us, but also as songwriter (Separate Ways, If Every Day Was Like Christmas being the most famous) and actor (Roadhouse). Update: apparently Red was born in March and not November (like Wikipedia suggested), so he was 81. 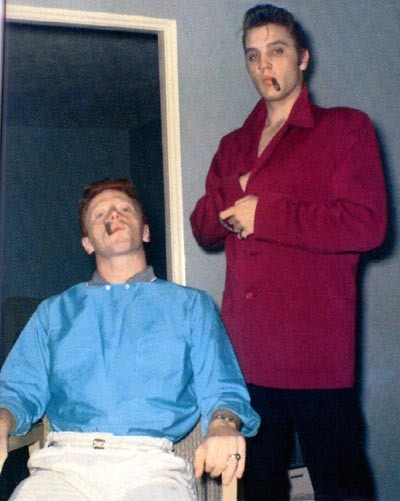 Red West, the longtime and sometimes critical confidante and bodyguard of Elvis Presley who became a successful film and television actor after the singer's death, died Tuesday night after suffering an aortic aneurysm at Baptist Hospital. He was 81. Born in Bolivar, Tennessee, the athletic Robert Gene "Red" West befriended Elvis at Humes High School, where the 6-foot-2 redhead protected the smaller pre-fame Elvis from bullies on at least a couple of occasions, according to Presley lore. He worked for Elvis for some 20 years, occasionally taking small roles in such films as “Flaming Star” and writing or co-writing such memorable Elvis songs as the 1972 hit "Separate Ways," the holiday favorite "If Every Day Was Like Christmas" and the 1975 masterpiece of infidelity, "If You Talk in Your Sleep," recorded at Stax. West also composed or contributed to songs recorded by other artists, including Ricky Nelson, Pat Boone and Johnny Rivers. An ex-Marine, Golden Gloves boxer, karate instructor and genuine tough-guy-with-a-heart-of-gold (at least in his later years), West said it was his protective streak that motivated him to co-write "Elvis: What Happened?," a tell-all best-seller published only two weeks before Elvis' death on Aug. 16, 1977, that documented the singer’s drug dependency and unhealthy lifestyle,. West and his co-authors, fellow “Memphis Mafia” members and Elvis bodyguards Sonny West (a cousin) and David Hebler, assisted by Steve Dunleavy, a journalist, said the book was an attempt to encourage Elvis to give up his dangerous ways, but some outraged fans said the memoir was written out of spite, since the three men only a year earlier had been fired from Elvis’ employ by Elvis’ father, Vernon Presley. As Elvis' friend, driver and bodyguard, West was among Presley's closest associates during the singer's meteoric rise, Army tour of duty, Hollywood stardom, late 1960s so-called comeback and 1970s decline. West's father, Newton West, died the same day as Elvis' mother, Gladys Presley, which only strengthened the men's bond. When Elvis was in the Army, West traveled to Germany to be nearer the singer, at Presley's request. West, Elvis and others would frequently spar at the old Tennessee Karate Institute in Midtown, co-owned by West. "He was a tough son of a gun," said former kickboxing world champion Bill "Superfoot" Wallace, one of the studio's co-owners. Prior to being fired, West and some of Presley's other bodyguards had received criticism for what the reference book "Elvis: His Life from A to Z" describes as "heavyhanded tactics" involving "too much physical persuasion," in an attempt "to keep the weirdos away from Elvis." West always defended his work for Elvis, while Vernon Presley said the firings were an attempt to cut Presley's expenses. Post-Elvis, West became a full-time actor, earning a regular role opposite star Robert Conrad in the late 1970s series “Black Sheep Squadron" (originally titled "Baa Baa Black Sheep"), about a squadron of World War II fighter pilots. West's most famous role was in the 1989 Patrick Swayze cult classic “Road House,” but major critical acclaim eluded him until late in life, when he landed his first top billing and the first lead role of his career in the acclaimed independent drama “Goodbye Solo” (2008), which critic Roger Ebert labeled "a masterwork" and The New York Times called "a near perfect film." “It took me 59 years to be an overnight success,” West told The Commercial Appeal, in a 2009 interview timed to the local release of the movie, in which he portrayed a taciturn old-timer contemplating suicide. On TV, he could be found in episodes of “Mannix,” “The Six Million Dollar Man,” "Magnum P.I.” and “The A-Team.” A 2015 appearance in the series “Nashville” was his final credit. In a 2011 episode of "Memphis Beat," a TNT crime series set but not shot in Memphis, West played a cancer-stricken inmate serving time for the murder of the father of the series' star, an Elvis-impersonating police detective played by Jason Lee. Red West and his wife, acting coach Pat West, had celebrated their 56th wedding anniversary on July 1. A Messick graduate who met her husband while she was working as a secretary for Elvis, Pat West said Red had complained of pains Sunday afternoon and was taken to Baptist Hospital. Early in the evening, he died after suffering what she described as an abdominal aortic aneurysm. Pat West said she and her husband usually skipped "Elvis Week," but they had been planning to participate in some activities organized this year by friend and longtime Elvis associate George Klein. "We wanted to go this year, this special year," she said, referring to the 40th anniversary of Presley's death. According to most sources (including Wikipedia and the Internet Movie Database), Red West was born on Nov. 20, 1936, which would make him 80 at the time of his death. But Pat West said his actual birthday was March 8, 1936. In addition to his wife, West is survived by two sons, actor John Boyd West, of Tampa, Florida, and Brent West, of Memphis; a brother, Harold West of Olive Branch; and six grandchildren. Memorial Park Funeral Home will handle services. another gone ! all going slowly , always read about the guy from the 60's now dead . Always felt Red jealous of Elvis . Red in the end was a far more talented actor and songwriter than Elvis . Elvis was good for comedy acting and that is about it . RIP. West lived to 80, whilst Elvis only lived to 42. As a loyal fan there is absolutely no doubt in my mind which is the greater loss..
My post didn't go through. Basically I said I am sad that he died but at the same time do not buy the entire BS line that they were trying to help Elvis by embarrassing him in public. They had to live with the fact that he died so shortly after the book came out. It's sad to see fans buying that line about "trying to issue him a challenge." They were trying to humiliate him and make money - period. Red even secretly recorded a call with him and put it in the book. Friends don't do that. Red at least had the dignity not to keep pushing the trash talk after Elvis died. I wish Sonny had followed his lead. Yes he was a good and talented Man and extremely sad he is gone R.I.P.